Waterfront in San Pedro, Ambergris Caye. Most people arrive to the island either by plane or water taxi from Belize City. For us, flying into Belize city was much more expensive than Cancun- and then the onward flight to San Pedro, Ambergris Caye was even more expensive. Therefore we decided to fly into Cancun, spending some time in Quintana Roo, slowly making our way to Chetumal via the ADO bus service. 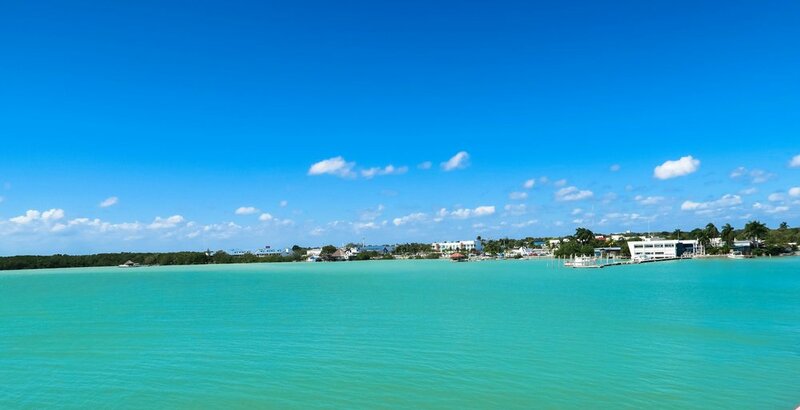 Chetumal is a city in the very south of Quintana Roo, just adjacent to Belize. Some people we met aboard the bus were continuing on to Belize via the bus system. This would likely be a cheaper option but takes more time. When you arrive at the Chetumal bus station, you’ll find yourself in a different area of the city than the water taxi departure. You’ll need to get in cab to get to the waterfront. It’s approximately a 10 minute drive and there are plenty of taxis available to get you there. First off, be sure to give yourself lots of time before your scheduled departure. Getting checked in and immigration take a while and you won’t want to be rushed. We’d highly recommend booking your ticket in advance. There are two water taxi companies, however, they go on different days so be sure to book your ticket with the right company for the day you’re travelling! It’s slightly cheaper to book a return ticket, but because we were returning on a day that the opposite company runs, we could only do a one way ticket (we booked our return ticket on Amberbris Caye a few days before our planned departure). We arrived about two hours before our departure time and already found there was quite a large line ahead of us. There was a bit of confusion over check in. When we had first booked our tickets online we had accidently booked for Caye Caulker instead of Ambergris Caye. We had emailed them to tell them my mistake and they quickly responded, refunded the tickets and asked us to rebook, which we did. However, when we went to check in they only had a record of the cancelled tickets. Thankfully I had a confirmation email printed off with me to prove we had actual tickets- but it took a few minutes to get sorted out. Once it was figured out, they issued us our tickets, returned our passports and put a sticky note with a number on each (more about that later) and informed us we’d have to go through Mexican immigration before departure. They also took our suitcases to be loaded aboard the boat. It appeared to us that the immigration kiosk was just across from the check in, however, it looked to be closed. So we made our way up to the rooftop restaurant to grab some lunch and enjoy the fantastic views. When we were almost finished, someone came up to ask if we’d gone through immigration yet because it was just about to close. In total confusion we rushed downstairs to find that immigration is actually just around the corner from where you check in and had likely been open that entire time. We got in line and waited our turn. One thing that I had read in advance is that if you have a flight already booked out of Mexico, you’ve likely already paid the departure tax fee- we had a confirmation on our phone to prove it. However, when we reached the kiosk, we were informed by the immigration officer that this wasn’t good enough and they needed to have a paper copy as proof. Thankfully one of the water taxi companies provides printing services (for a fee). We were certainly not the only ones with this issue and we waited in line to get this printed. They gave us their email address, we paid them and then did the printing for us, it took about five minutes- all while employees tried to rush us informing us that immigration was going to close any minute. Thankfully once printing was completed the rest of the process was quite quick. From there we were asked to wait around until other immigration officers arrived to check our bags. This was quite a waiting game and in the end it meant our boat left about an hour later than scheduled. Finally two officers arrived with a dog. They had us all put our bags down in a straight line while the dog went back and forth and up and down to sniff them for illegal substances. It’s quite the intimidating process but thankfully there were no issues. Lookoff from the water taxi pier in Chetumal, Mexico. With customs and immigration completed we were allowed to board the boat. It’s a bit of a rush as everyone tries to be in the first in line to get aboard and have their pick of seats. The water taxi is essentially a large speed boat where everyone is seated indoors. Seating on this boat was quite uncomfortable with only bench seats with zero padding. It takes about 1.5 hours to cross. There was a bathroom aboard the boat but we got the impression it’s for emergencies only. It was a relatively smooth day and we had no issues, other than boredom! Everyone appeared to be fine and we didn’t see any evidence of sea sickness. Onboard they do offer money exchange if you’re in need of some Belizean dollars. 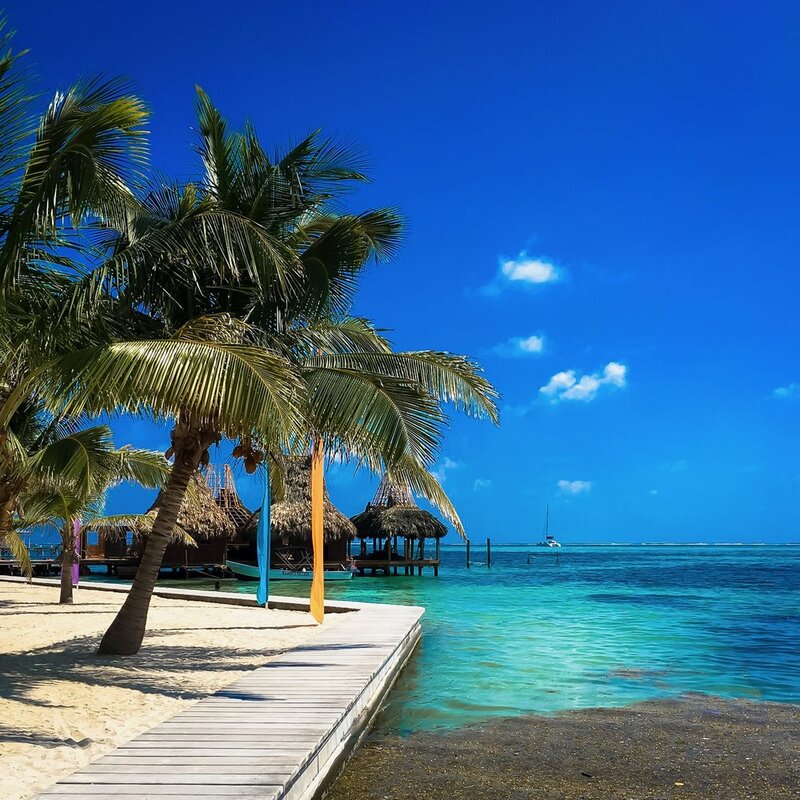 Even if you’re heading to Caye Caulker, you’ll still have to exit in Ambergris Caye for immigration into Belize. Once everyone was off they had us collect all our luggage. They then told us to line up according to the number they’d placed on our passport. We have to assume they do this for organization purposes but it actually ends up creating more confusion and frustration! Other than that, immigration into Belize went smoothly and relatively quickly once we got through the line. 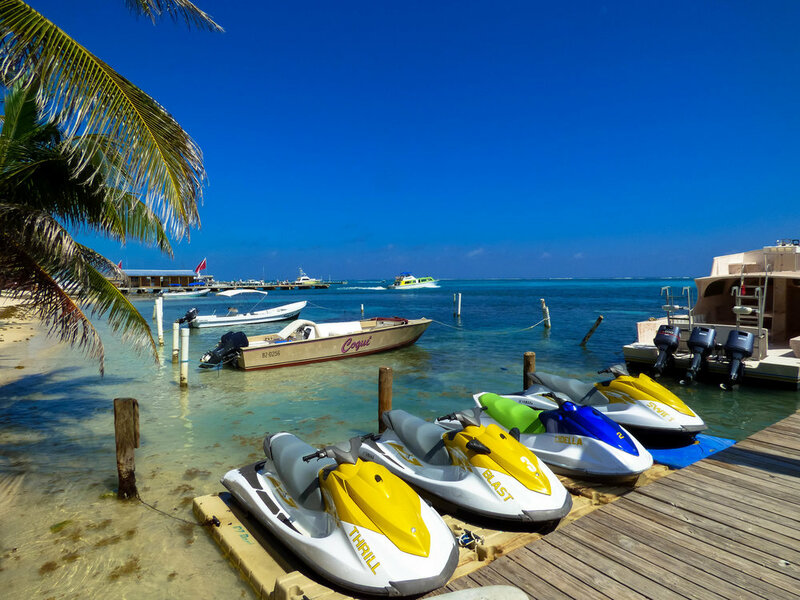 If you’re staying in Ambergris Caye you’re than free to go, but if you’re heading to Caye Caulker you have to wait until everyone is through before your next boat departs. As we were departing Belize from Caye Caulker, we took a very early water taxi to Ambergris Caye where we had to go through customs before leaving the country. The lineup process was again a bit confusing but went quickly once it got going. They also do currency exchange here, making it a good time to get rid of any left over Belizean money. Once through customs you just need to make sure you have your ticket ready and wait until they announce boarding. As we mentioned before, we had to travel with a different company on the way home. We actually found this boat a bit more comfortable with individual cushioned seats. Again, you’ll need go through immigration before entering Mexico. Similar to when we departed, they had us put our bags in a straight line while officers and a dog walk up and down and the rest of us stand around and watch. Afterwards they had us get in line for the immigration kiosk. Thankfully we’d posited ourselves in a spot to be near the front. Assuming it was plenty of time, we only gave ourselves an hour between arrival and our bus departure. If we were towards the back of the line, we wouldn't have made it. For some reason they only hand out immigration forms once you’re in line so there’s a bit of a rush as everyone tries to fill out their forms as quickly as possible! Once out we were done, we were easily able to get a taxi back to the bus station and made it with a bit of extra time before our departure. Boardwalk in San Pedro, Ambergris Caye.